In 2012, Amanda Pilgaard was at the end of her rope: Her six-year-old’s frequent bedwetting was taking a toll on her whole family. Most nights Pilgaard or her husband were awoken from their deep sleep to change their son’s bed sheets. And every morning they’d wake up to a big pile of laundry. So, when a parent in her neighbourhood in Vancouver suggested that her son sleep on the absorbent hot yoga mat that he had invented – and which his wife used for their kids’ nighttime bedwetting – she was ready and willing to give it a try. Pilgaard reached out to Liz Brezer, the wife of the hot yoga mat inventor who was also the mother of one of her son’s classmates. 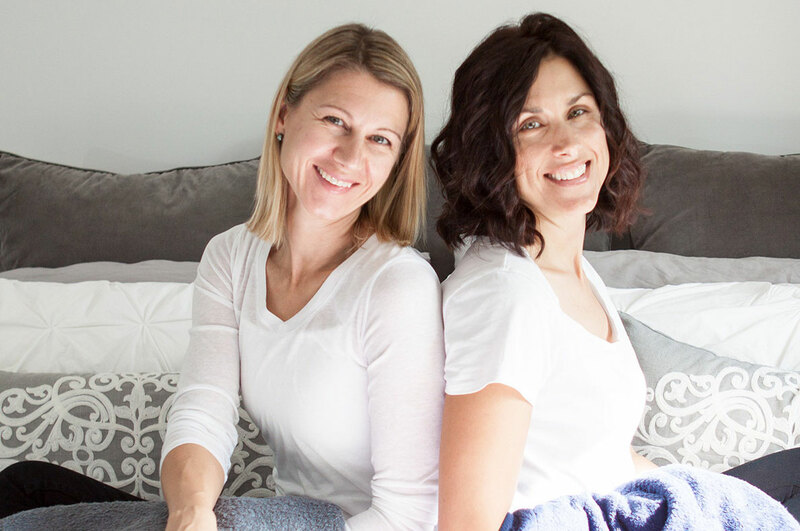 Although they hardly knew each other at the time, they hit it off right away and started making plans to develop a bedwetting and incontinence mat similar to the yoga mat. At the time, both women had busy careers – Brezer was a real estate agent in the hot Vancouver market and Pilgaard was an executive in the wireless industry. The more effort they put into developing their product, and researching the market for it, the more they were convinced that they should jump in with both feet. And so out of the founders’ mutual struggle the brand PeapodMats was born. The finished product they created is very impressive and versatile. The mats are soft, absorbent, waterproof and washable and stay exactly where you put them without straps or Velcro. They come in three different sizes, a variety of colours, and can be used on beds, couches, car seats, strollers, wheelchairs and more. Fast forward three years, when Pilgaard and Brezer pitched their products to five seasoned entrepreneurs on Dragons’ Den. They were “early”, having only sold 800 mats through online channels, but were confident that they had a winning product on their hands. Beer industry leader Manjit Minhas thought so, too, and struck a deal with Brezer and Pilgaard. That’s when their business really took off. Thanks to their hard work, and the incredible boost from Dragons’ Den, the company is on track to hit $1 million in revenue for 2018. That’s an increase of more than 60 per cent since last year. Today, PeapodMats are sold through different channels. Approximately half of the mats are sold through Canadian retailers such as Bed, Bath and Beyond, and smaller boutiques and pharmacies. The other half are sold online via the PeapodMats website, Amazon.ca, Amazon.com and its European affiliates. Brezer and Pilgaard’s shipper of choice? Canada Post. Canada Post makes their shipping straightforward and dependable. Pilgaard likes being able to track her shipments with Canada Post and the fact that she can be “100 per cent confident” that packages sent with Canada Post will arrive at their destination on time. For payment processing, PeapodMats has partnered with PayPal. Their customers can pay through their PayPal account or have PayPal process their credit card payment. The online payment system appealed to Pilgaard and Brezer because it’s a trusted name in the online marketplace, where savvy shoppers are on the lookout for possible scams. “A customer places an order, we go into our PayPal dashboard, and with a couple of clicks we get that label printed and the order out the door,” Pilgaard said. The program gives them access to great money-saving opportunities that help them save on shipping and direct mail campaigns, gives them access to Canada Post Snap Ship™ –an affordable small business shipping tool– for their parcels, helps them accept online payments easily via the PayPal integration, and allows them to arrange scheduled and on-demand pickups from their business – plus enjoy a simplified returns process. As entrepreneurs who wear many hats, simplicity is key. Pilgaard and Brezer have grown their business to the point where they now outsource their warehousing (they used to store their products in Brezer’s garage), accounting, web design and marketing. But they’re still PeapodMats’ only employees, do all the order fulfillment themselves and are happy to roll up their sleeves and get their hands dirty when needed. Brezer’s advice to would-be entrepreneurs is similar. Are you ready to take your small business to the next level? Canada Post Solutions for Small Business program can help! Registration is free, so why not start saving on shipping today.